If you have printed your own rEvolve, you will need velcro, padding, and springs to assemble it. We are proud to support all the Makers out there with this bundle to make creating your own VR head strap that much easier. Now it is with rEvolve! rEvovle is a new Vive accessory that provides a flip-up display, perfectly centered weight distribution, and fits with a single grip. So putting on and wearing your Vive (Virtual Reality Headset) will be as effortless as wearing a baseball cap. Plus, you will enjoy a more immersive VR experience with the increased field of view and a hassle-free audio experience, now that the headphones are routed through the rEvolve. Amazingly, the rEvolve does all this by simply replacing your current Vive straps. The stock Vive weighs in at 1.2 lbs and is worn with straps that squeeze the headset to your face. This leads to an uncomfortable experience and red marks on your face when worn for prolonged periods of time. The rEvolve replaces those uncomfortable straps with a rigid, comfy headset that provides balanced weight directly above your forehead. If you have used the Vive headphones before, then you know the drill. Once you have managed to strap the headset to your face, you are left blindly trying to find the headphones, and when you do find one, you are hoping it's on the proper side. No more! With built-in headphone slots, you will never have to search again. They will simply hang right next to your ears waiting to be easily inserted at a moment's notice. Using the Vive can be a real workout, and when you work out, you sweat. That is why we designed the rEvolve headset with swappable padding. Between sessions you can pull one of the velcro pads off and replace it with a fresh one, remaining clean and comfortable for you, or the next user! While using the Vive, there are often times when you need to interact with the real world and then hop back into VR. Previously, you would have to totally remove the headset, take care of the interruption, and then reapply and readjust the headset. The rEvolve solves this hassle by allowing the headset to flip up or down at a moment's notice so that it will be an effortless experience the next time you are talking to someone, taking a drink, troubleshooting, or just trying to see what you stepped on! The way the current generation of VR headsets work is: the closer you are to the lens, the more screen you will see. 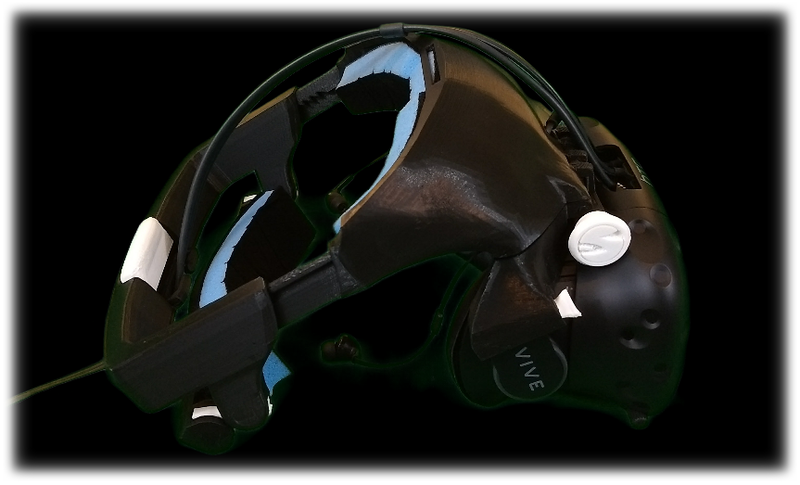 The standard Vive needs to have padding around the eyes because of the pressure that the straps put on the face. However, the Vive with rEvolve removes the pressure from your face, which allows the rEvolve to use much thinner pads. This makes it possible for your eyes to get closer to the lens and see more of the screen. With half a dozen wireless VR adapters (TPCast, Rivvr, KwikVR, DisplayLink, Mach-2K, Nitero, and Quark VR) set to come out in 2017, there is no way we could build rEvolve to automatically support them all. So we built a bar into the top of the rEvolve that will allow for custom accessories to hook into it. We will offer an adapter of your choice as wireless solutions come out, as well as 3D printable files of each adapter if you want to print your own! When you finally have a moment to hop into VR, the last thing you want to be doing is trying to fiddle with velcro and finicky straps to get the headset to fit properly. This is why the rEvolve is designed to fit any user with a single grip located on the back of the headset. Simply squeeze the grip and adjust the length of the headset until it fits you perfectly. Then, let go and enjoy the most comfortable VR experience you have ever had! We decided to use additive manufacturing for the rEvolve because it allows us to have full control over every millimeter of the final product. Recent enhancements in 3D printing materials have empowered us to deliver a final product with the strength you expect from consumer level products. Comfort was our number one concern when designing the rEvovle, but our number two concern was convenience. This is why the back pad has multiple pivoting points, allowing the rEvolve to fit any size head quickly, and most importantly, comfortably.